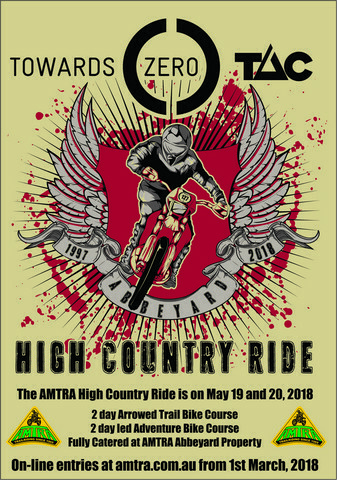 The 21st HCR, run by AMTRA is on so save the date 19th and 20th May 2018. Open to full reg and also rec reg bikes. All riders must be licensed. Adventure bikes will also be catered for for the first time this year. Entries for the HCR are now open here (see link). Entries for the HCA (Adventure ride option) will be open soon. So come and join the fun on the best weekend ride in the Victorian High Country with AMTRA. The weekend is fully catered from breakfast on Saturday through to lunch on Sunday. Light snacks will be also available on the Friday and Saturday evening and drinks will be also available from the cash bar. Our sponsors will be on board again this year and a raffle will be drawn Saturday night with rider giveaways as well. Well organised and a great area to ride.